We have rated and compared the most efficient space heaters on the market. Our reviews cover quality electric & propane and mica-thermal options. 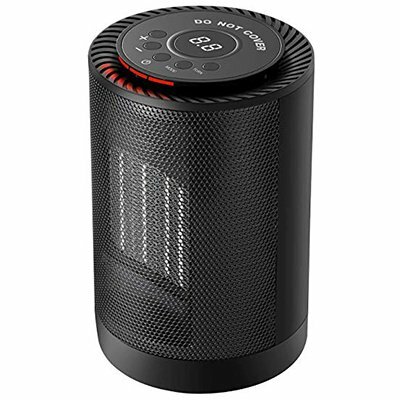 This rotating space heater works effectively in larger spaces. It is estimated to run at about 18 cents per hour. This personal heater works quickly to give you immediate warmth. It is estimated to run at about 12 cents per hour. 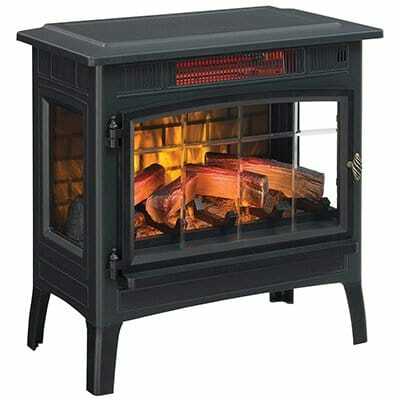 This fireplace stove heater is best suited to family loungerooms. It is estimated to run at about 18 cents per hour. Many people choose to use space heaters as a supplemental heat source during the cooler months of the year. Space heaters are usually portable, small appliances that can create heat in a specific direction or location. Using a space heater in addition to your home furnace can help you save energy (and as a result, save money) over the course of the season, as demonstrated in this article by Energy Star. Our aim is to take a look at the best, most energy efficient space heaters on the market today. Space heaters are heaters that are meant to provide heat to a specific room or area within your home. Most space heaters electric and can be plugged into a standard wall outlet, which makes them an easy and popular choice. These electric models use Joule heating, meaning that they create an electrical current that runs over a conductor to produce heat. Then a fan will push the heat out into the room to help keep a consistent warm feeling. There are also gas space heaters available, and they run on one of three combustible fuels: propane, natural gas and kerosene. If you are worried about having a heat supply when the power goes out, a gas-powered space heater would be a great option for you as they do not require electricity in order to function. These heaters used to be a lot more maintenance than they are today because they had to have a full-vent to the outdoors to eliminate carbon monoxide. Today, thanks to science and technology, we have ventless gas heaters that have eliminated the air exchange and can be used safely within homes. It should be noted, however, that this new type of space heater is currently illegal in several jurisdictions, including the entire state of California. Check your local regulations before purchasing. Today in the United States, many appliances come with what is called an Energy Star rating, and this is a calculation of exactly how energy efficient the appliance is, as well as the average cost to run the appliance. With space heaters you won’t find an Energy Star rating, and this is mostly because there are a lot of other factors that will go into exactly how energy efficient the product is. This includes whether you are using the space heater by itself or with supplemental heating, the area of the room, and more (which we will discuss below). The lack of an Energy Star rating does not mean that space heaters aren’t efficient though, it just takes a little more work to found out which products are more efficient than others. How to computer using an online calculator? Click here. How to computer manually? Click here. The size and shape of a room will greatly affect the type of space heater that you will want to use. Most space heaters are sufficient for standard sized living rooms of 200-300 square feet and that are closed off from other spaces by a door. If the space you would like to heat is larger or is open to other areas of the house, you may want to consider using more than one space heater to evenly distribute warm air. Does The Room Have High Ceilings? Rooms with vaulted ceilings are harder to heat because heat rises naturally. Even if you have a smaller, closed off room, you will need a space heater with more power if the ceilings are vaulted, or you will risk over-working your space heater and never truly feeling warm. If your room with high ceilings has ceiling fans, it will help to set them to “winter mode,” or to run clockwise. This will help push the heat back down into the room. Does The Room Get Drafty? 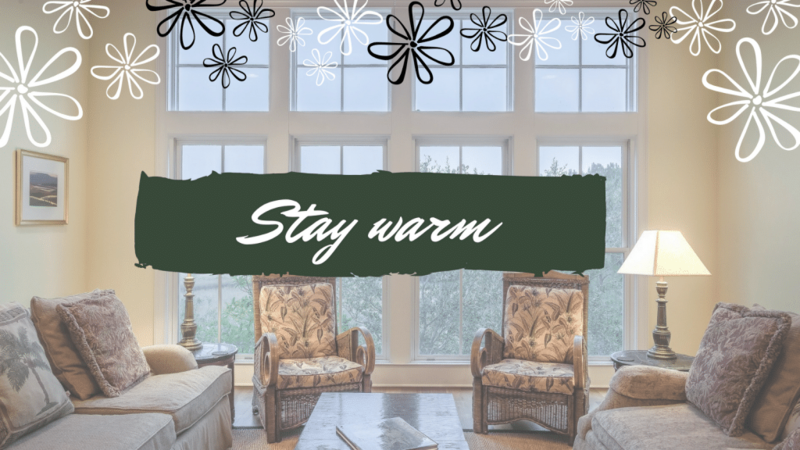 One of the biggest problems with heat loss during the cooler months is cracks near the windows and doors that allow cold air to seep into a room (and thus, also let warm air escape). If you feel a draft in your home, the best option is to try and seal it, either permanently or with the old trick of stuffing a towel into the crevice. Also make sure that your space heater is pointing well into the room and away from any “leaky” areas. Are The Walls Well Insulated? Most of the indoor space heaters we look at in this article are intended to not only be used as supplemental heating, but also used in rooms that are well insulated. Running a space heater in an uninsulated area, like a shed or garage, will use more energy and take much longer to be effective. Watts are how we measure the flow of energy in electrical appliances. Most of the space heaters we look at here are electrical and can be plugged into a standard wall outlet. When you look at your utility bill you will see the term kWh, meaning kilowatts. Kilo means one thousand, so if you used your 1,500-watt space heater for one hour, you are using 1,500/1000= 1.5 kWh per hour. Your bill will help you see the local cost for this amount of use, so you can easily estimate future costs. In the United States, that average price for kWh is about .12, so for the purpose of this article we will use that figure when estimating the estimated cost per hour in each product’s chart. BTUs are British Thermal Units and are what gas-powered appliances run off of. This helpful resource will help you determine how much money your space heater will cost with regular use. You simply find the type of fuel you are using (propane, natural gas, or kerosene) and how much the fuel costs and match it to the BTUs your unit has. We will use this calculator to estimate the cost per hour on high for the gas appliances we discuss in this article. Different levels – Some have two settings (low, high), some have three (low, medium, high). Sliding adjustment – This works like a dimmer would on a light, and the unit offers a variety of temperatures as you adjust the dial between low and high. This kind is great for adjusting the temperature in small increments. Digital thermostat – These models have a built-in thermostat that allows to adjust the temperature to your desired temperature. It’s important to check the safety features of a space heater before purchasing it, especially if the heater will be used around children or pets. Some of the safety features we look at in this article include: a tip-over auto-off function, cool touch exteriors, oxygen sensors, safe-plugs, built-in overheating shut-offs, and timers that will turn off the product after a specified amount of time. It is recommended that space heaters are only used when you will be in the room to supervise its functionality, but safety features provide an extra precaution against malfunctions or misuse. It’s also important to follow the user guide to your product completely and keep your space heater away from curtains or other flammable materials. How easily a space heater can be moved around might be another consideration you’d like to make before purchasing. Many of the space heaters that we look at in this article are easily manueverable and weigh under twenty pounds, making them ideal for carrying from room to room. Some models even have a built-in carrying handle. Some space heaters, however, will be heavier and more difficult to move without assistance, especially the oil-filled radiator heaters. And obviously some space heaters will call for wall mounting and a gas hook-up, in which it will be important to decide on ideal placement before installation. Noise levels are often measured in dBa, a measurement of decibels. Typically, the higher the dBa, the louder the product is, and this will be a standard measurement on things like vacuum cleaners. 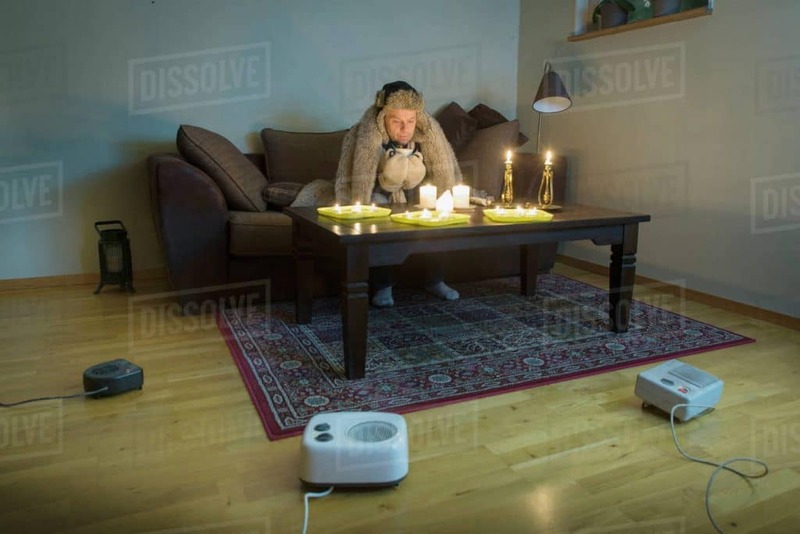 Space heaters are, in general, quiet appliances that should not interrupt other devices that you are using (like a television), so products are not advertised with their dBa. When consideration the design and features of a space heater in terms of energy efficiency, the top picks will likely include an eco-mode feature, an adjustable thermostat, timers, and the amount of power it takes to run. Additional features that may be of interest to you include fans (oscillating or otherwise), remote controls, and adjustable lights or fireplace ambiance. We recommend always looking at safety features before looking at design features, because we truly believe that its better to be safe than sorry. All of the space heaters that we have reviewed in this article come with some sort of warranty from the manufacturer, and the standard amount of length is one year from the date of purchase. After purchasing your space heater, make sure to read the warranty information carefully so that you will be completely covered during the allotted time. Warranties are made to cover any malfunctioning you may experience with the space heater when using it exactly as the directions describe. If you are misusing the product (have failed to clean the filters, have used an extension cord when it says to put directly into wall, etc.) the warranty may not cover your issue. Many manufacturers require that you pay to ship the old product back to them before receiving a replacement. The Presto Heat Dish was designed with energy efficiency in mind. In fact, it only costs about $0.12 per hour, which means that you could easily use it for the better part of a day and still come in at under a dollar on your electricity bill. I think it’s fitting that the name of this heater is “Presto” because it really does somehow (magically?) provide instant heat. It’s designed to be a personal heater, so it won’t necessarily heat your entire room, but pointed directly at you it will be quite comfortable. We have other options for whole room heating below this product. And although it might look like it oscillates like a regular table fan, it doesn’t – so just be aware of that before purchase. Some users have mentioned that the fan design of this space heater makes it hard to clean, because there are so many nooks and crannies that are hard to reach. We have found that using compressed air to clean the heater regularly will work like a charm. 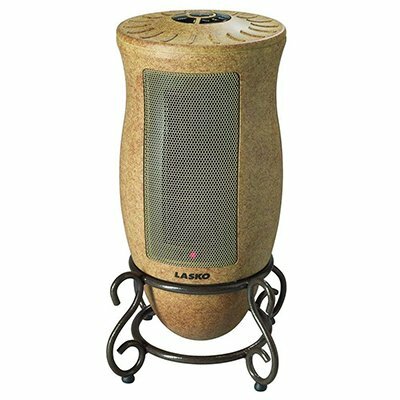 The Lasko 6405 is a great option for the person who wants a solid space heater but doesn’t like the boxy designs that most options come in. With its own pedestal, this space heater truly looks like a design element that would fit in any home. In fact, your guests might mistake it for a ceramic vase! Looks aside though, this oscillating space heater also functions with the best of them and used as supplemental heating can help heat up to 1,000 square feet. You can choose to have the airflow either one-directional (for a more direct, hot-heat) or oscillating to better distribute the heat for a larger room. The timer is located on the top and super easy to set-up. The heater only runs for a maximum of 7 hours at a time. This is a great feature for someone like me who tends to doze off the moment I’m cozy watching television. Does not save your preferred settings. Resets each time you turn it off. I’ve had the pleasure of reviewing this Duraflame Fireplace Stove several times, and time and time again it has really stood up to the test. It’s slightly more expensive than some of the other space heaters we’ve looked at, but I really feel you’ll be getting your monies worth in both the design and functionality of this unit that looks like an old vintage fireplace stove. It looks great in any room, and your guests might be surprised to learn that the “fire” isn’t fire at all, but a beautiful 3D effects feature. Most importantly though is that this Duraflame model really works and can easily help heat up to 1,000 square feet of space. It has a cool-touch design that makes it safe for use around children and pets, and the controls (including a digital thermostat) are hidden inside the front door. My kids love pressing buttons, so having them hidden away is an excellent feature in my book. The only downside is that the remote control (which is included) only works when the door is open, and the panel is in view. The electrical cord is very short. Plan to place right in front of outlet. Remote only works if panel door is open. 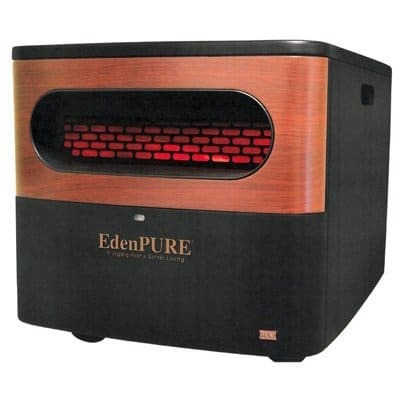 It’s a little hard to classify the EdenPURE as a space heater, because in reality it is a space heater and so much more. It has a fan mode that allows you to evenly distribute air even in the summer, and it also has upgrade kit that includes a HEPA filter and makes it a world-class air purifier. Staying warm and cozy while killing the bacteria and allergens in the air? Sign me up! If you’ve never tried the EdenPURE brand, you might find it hard to believe that such a small space heater could heat up to 1,000 square feet of space like it claims to but seeing is believing! This small unit would be the perfect accompaniment to an apartment or large living space. Probably my favorite feature is the adjustable thermostat, which can be increased or decreased by single degrees to ensure that you are exactly at the temperature that you desire. Though one of the most expensive space heaters on the market, we were hard pressed to find many flaws with this one. This portable space heater by SENDOW is so small that on first review you might mistake it for a speaker or Amazon Alexa device. In fact, it is the perfect personal space heater for your desk in a drafty office space, and it’s so quiet that your neighbors won’t even know that you have it until they come over and realize how toasty warm your office area is! I love that the controls are located right on top and they are super easy to use and understand. There is a high setting, a low setting, and a fan only setting which is great for creating air flow in the warmer months (especially if you live somewhere incredibly humid like I do). There is a safety feature that will automatically turn off the unit if you knock it over or if you pick it up. This is slightly a nuisance when I just want to move it a few inches on my desk, but restarting the unit is easy and I do appreciate the added safety it provides. 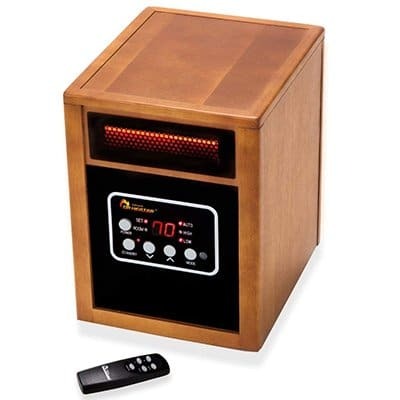 The Comfort Zone Oscillating Space Heater would make a great addition to any standard sized living room or bedroom. I especially like ceramic space heaters like this one because they have the ability to heat up very quickly. This model will give you fast heat, and when used with the installed “Eco-Mode” it will automatically change its function from high to low when your desired temperature is reached. It will then change back to high once the area has cooled off too much. The savings will only be a few pennies worth each time you run the unit, but all those pennies will soon add up over time! This Comfort Zone heater comes with a built-in timer that will ensure that the product functions no more than eight hours at a time. It also comes with a remote control, which means you don’t even have to get up to adjust the settings. Oil filled space heaters are great energy efficient space heaters for large rooms, because they are practically maintenance free and the oil inside never has to be replaced. This oil filled radiator heater by COSTWAY is a great choice because it comes with all the charm of a vintage style radiator with all the technology and functionality of our world today. Although oil filled heaters in general take longer to heat a room than other types of space heaters, once the room is warm, they are very good at managing a consistent heat. And honestly this unit will heat up your room faster than you’d think! These units require extra supervision when there are children or pets near, because their exteriors become incredibly hot to the touch. 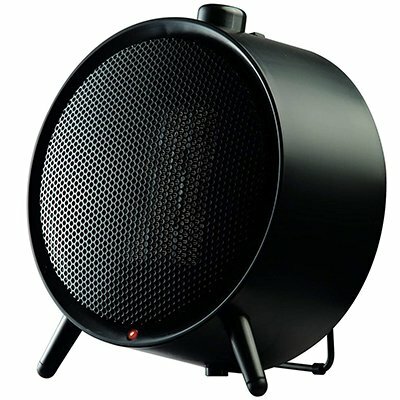 This heater is available in both 14 inch and 25 inch models. The only drawback to this COSTWAY model is that they only provide you with a 90-day warranty, whereas most of the other models we look at provide a year at the minimum. 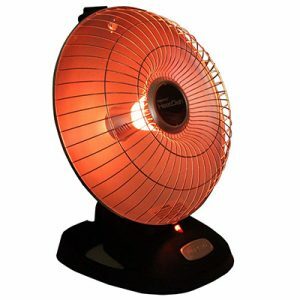 The Dr Infrared Heater is one of the newest space heater models on the market, and it is designed and engineered in the United States. Their motto is that they can deliver 60% more heat than other 1,500-Watt space heaters. They’ve achieved this by installed a high-efficient seven-inch fan in the unit, whereas more competitors only use a three-inch fan. The result is faster, hotter heat for your room. I love the wooden body on this space heater. It’s a classy look that will fit into any home’s décor. The outside of the unit does get warm to the touch when in use, but not so hot that it would harm you if you rested your hand on it. This unit does need to be “off-gassed” or used somewhere with lots of ventilation when you first receive it to get rid of the yucky factory smells. Heavier model, weighing in at 25 lbs. This little personal heater is so portable that you will literally want to bring it everywhere with you – to have on your desk at work, to have on your feet while you cook in the kitchen, or on a table next to you while you cozy up and watch a movie. The low setting is perfect for heat directed towards one person, and the high setting is great for larger groups or heating more space. My initial concern with this unit is that when looking at it, it would seem that the exterior would get hot upon use of the product. I was pleasantly surprised to learn that it has a cool-touch exterior, so I would recommend if you have young children or pets who are curious! It also has a four-way auto-off, meaning any way you knock it over it will turn off. If you have a little extra cash and you’re looking for a more permanent energy saving space heater, the Convectair Apero is a great option. 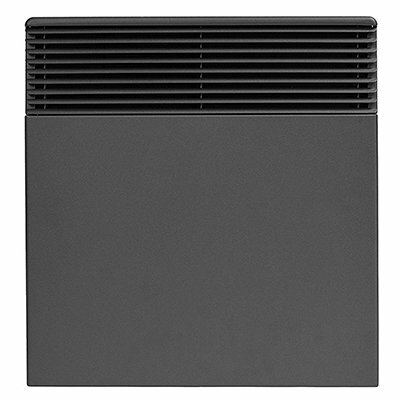 It’s a wall mounted, hard-wired space heater that is known for being affordable and quiet. I really like that unlike some wall units, the Convectair Apero has a built-in thermostat that is super easy to use, and the temperature controls are also extremely sensitive, meaning you’ll get just the temperature that you want. This unit would probably work best in a standard sized bedroom or closed living room but being born and raised in chilly Michigan I can attest that one of these at each end of a large family room or basement can make all the difference in the (cold) world and help you significantly with your heating bills. This unit also comes in two different colors and will seamlessly blend into your décor. Radiant and Infrared heaters are really one in the same. 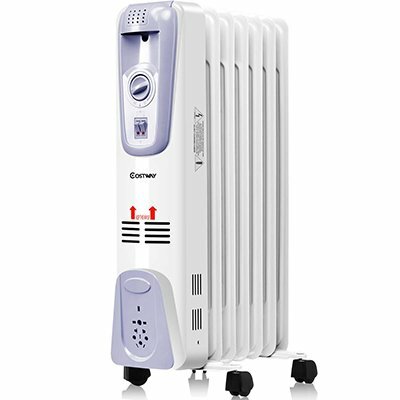 They are electric heaters and work by heating either an electric coil or quartz tube. The heat is then transferred out to the consumer as IR, or infrared radiation. These units heat up very fast and are often hot to the touch on the outside. You will feel the most benefits from these heaters if you are sitting nearby them, but they will also do a great job warming a large room. Because infrared heaters transfer nearly all of the heat that they create, they are often the most energy efficient of all space heaters. The term “forced air” is used to describe the action of a space heater pushing air over a hot heating element to create warmth in the surrounding area. Typically, when a product is advertised as forced air they are talking about a more industrial-strength wind than you would expect for your average indoor heating unit. These forced air units are almost always run on a combustible type fuel (propane, natural gas or kerosene) and are best suited for well ventilated areas, like an outdoor workspace or an open garage. Forced heaters are not as energy efficient as other types of heaters, because the forced air functionality uses more energy. Ceramic heaters are often more energy efficient than other models on the market because they are able to heat up very quickly. Unlike some models where the whole unit gets hot, only the heating element in ceramic heaters gets hot. The ceramic part is the inside part that heats up when electricity is transferred to it from aluminium fins inside the element. A fan is then used to push the hot air over the ceramic plate out into the room for you to enjoy. How do you measure your room size correctly? To measure the area of a room, measure the length of the room and multiply it by the width of the room. For example, a room that is 18ft by 13ft would have an area of 234 square feet. Space heaters, when used exactly as indicated by the user manual, can be a very safe option for supplemental heating. Most space heater related fires are due to the appliance being misused or unattended. Can you leave them on all night? It is not recommended that you leave a space heater on while you are sleeping or not present in the room. Although many space heaters have built-in safety features to prevent fire or damage to the product, it is risky to assume that they are as safe as your home furnace. How much electricity does a space heater use? Multiply the products watts by the number of hours you plan on using the product per day. Watts X Hours = A. Multiply A by your current kWh rate (found on your utility bill). A X kWh = B.
Divide B by 1,000. B/1,000 = C, your average cost to run a space heater per day. What is the most energy efficient space heater on our list? We highly recommend the Presto Heat Dish for instant heat at just $0.12 per hour at the national average of kWh. Can space heaters save you money? When used as supplemental heating, space heaters can save you on your monthly heating costs. It is recommended that you lower your home thermostats and use space heaters only in the room you are occupying for maximum benefit. Using a space heater as supplemental heat can greatly reduce your energy costs. And putting in a little research on the most energy efficient space heaters, like we’ve done here, can save you even more. The most energy efficient space heater on the market that we’ve found was the Presto Heat Dish, but all of the options we’ve viewed would make a great choice to help you save a few dollars on heating costs.